Leoneda Inge reports on the revitalization underway in East Durham, near the new Maureen Joy Charter School. Self Help's Tucker Bartlett with Maureen Joy Charter School students at ribbon cutting on South Driver Street. There’s a section of East Durham undergoing major revitalization, and in the middle of it all is the oldest existing school building in the city. But today, more than 100 years later, the old East Durham Graded School has been renovated in grand style. The project is getting a lot of attention and economic developers and neighbors hope it’s the spark that will keep community revitalization going. Children at Maureen Joy Charter School are joyfully greeted by teachers as they get off the bus and march into their new school. There are some smiles, some high-fives, some yawns and at least one tiny little girl in tears. School has only been in session for a few weeks. The children at Maureen Joy, decked out in matching light blue shirts and navy bottoms, are a diverse bunch. It’s a lot different from the days when students in the building at 107 South Driver Street were all white, and so was the neighborhood, filled with mostly cotton mill workers. This building hasn’t served as a grade school since 1967. The school was moved to another location as Y. E. Smith Elementary. By the 1980s, East Durham was mostly African American, lower-income, full of rental properties. Jobs were hard to come by. Poverty started to set in. Carrie Walker lives across the street from the new Maureen Joy Charter School, where her grandson is a student. “I’ve been living over here in this area for over 35 years, and it’s a blessing to see that this school is being built in this neighborhood," said Walker. The recent ribbon-cutting at Maureen Joy brought a huge crowd. Charter schools are independently operated public schools. Many of the children attending this school already live in the area. Maureen Joy is one of the oldest charter schools in North Carolina with more than 350 students. Administrators say the new building will help them grow to at least 600 students in coming years. Durham Public Schools superintendent Eric Becoats has a good relationship with school leaders at Maureen Joy and stopped by to celebrate. “The bottom line is education and educating children. So, we talk, we communicate, we share success stories and we share things that may work well on this end as well as on our end. So, all of us are here for the same purpose, to educate children," said Becoats. 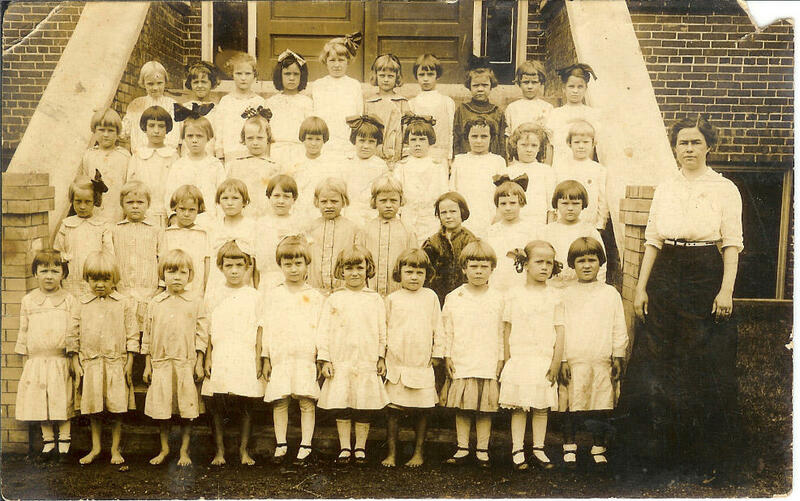 Students at East Durham Graded School on South Driver Street, circa 1915. It wasn’t easy restoring the historic East Durham Graded School. The non-profit community development lender Self-Help invested over $10 million dollars. Tucker Bartlett is Executive Vice-President at Self-Help and spear-headed the project. “The floors were coming off of the walls, so it was a building that needed to be rescued quickly. But it still had some good features," said Bartlett. An expert team, including Durham architect Eddie Belk, who’s known for historic work at American Tobacco and Brightleaf Square, worked on the school for three years. Bartlett says this is his favorite project so far. “It’s because there were so many stakeholders involved and so many positive impacts," said Bartlett. Bartlett says $4 out of every $5 spent on the renovation of the school stayed in Durham. There are signs all up and down South Driver Street of revitalization – starting with a house directly across the street at 118 South Driver. I took a quick, cautious look inside the Victorian Gothic cottage with Wendy Hillis, Executive Director of Preservation Durham. "No, I am not sure that there are no animals in here," said Hillis. After eight years, Hillis says, they were finally able to sell the house last week. “It has very short ceilings on the inside. It’s an interesting little space. I think it has great street appeal though. I think it’s super cute from the outside and it’s in such a great location across the street from the new school. This is just, so much happening on this street," said Hillis. In the next block, headed towards Angier Avenue, men are directing traffic as road work is being done and a building is being renovated. And then you reach the intersection of South Driver and Angier Avenue. You can’t miss Joe’s Diner. Owner Joseph Bushfan says everything started turning around in the neighborhood when it was listed on the National Register of Historic Places. He says the opening of the old school building will help even more. “I think that’s going to add a little bit more color, vibrancy to the community. It’s going to add safety to the community. That’s our future and we need to protect those children from kindergarten to eighth grade," said Bushfan. The city of Durham is spending almost $4 million to create a streetscape at Angier and South Driver in hopes of bringing more commercial business to the community. It’s a priority area for the city that Bushfan says is already a lot more wholesome and happy, because of the school. Next year, 26 new charter schools will open their doors to students in North Carolina. An additional 170 groups filed initial applications to open charter schools in 2015. The growth comes on the heels of legislature eliminating the 100 charter school cap and voting to form a new advisory board to consider charter school applications. Host Frank Stasio talks with WUNC education reporter Dave Dewitt about the changes in the charter school movement and the ways the state regulates these independent institutions.